OK... Credit... See the beautiful bird in the photo to the left. That came from Chris of the "Nibble Me This" Blog and his Orange and Bourbon Brined Turkey on the Grill. 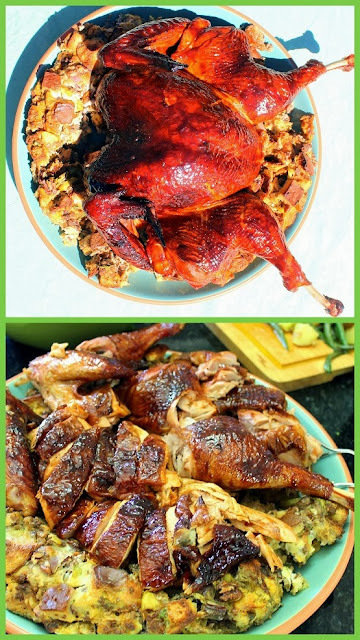 While I have seen plenty of recipes and TV shows with the butterfly turkey look, it took Chris's post to get me excited about doing this on my own. If you have never tried one, I really recommend you using the blue letter link or I also put a link on his photo, double click either to magically see his post with LOTS of details, hints and photo How-Tos so you can amaze your friends as well. My bird had a few differences. First, I slow smoked mine on a Weber Kettle Grill. Indirect heat, temp of the kettle averaged between 225 and 250. I have spent my summer rediscovering the thrill of the simple but AMAZING Weber Kettle. Inexpensive, easy to use and absolutely you can smoke on them. Take a look at THIS POST to see the details of indirect smoking. EASY EASY EASY and don't use the excuse that you don't have a thousand dollar smoker hold you back. One important note, small birds are better. Easier to cook to temperature without drying out. Mine was a 14 pound bird. If you need a bigger bird, consider making two. Next important note... Cook to internal temperature using a meat thermometer ONLY. Do not use that little pop up thing (rip it out). It will only go off when the bird is OVER COOKED. Measure the internal temperature with a meat thermometer. Cook to 155-160 degrees at the thickest part of the bird and also measure at the thighs. Remove the bird from the heat and allow to rest for 15 minutes before carving. During that time the internal temp will rise to 165. That's it... no more... 165 is the goal. My cooking time was longer, nearly 4 hours. It is also important to know that the meat from a smoked turkey will actually look pink throughout. It will be fully cooked, taste great but appear pink and undercooked. I fixed this by injecting my turkey with an Injectable Marinade. There are several commercially available brands available. I had planned to come up with my own recipe, but I was pleased to see a bottle of STUBB's brand Chipotle Butter Injectable Marinade in the "damaged packaging heavily discounted" bin in my store. The bottle of spiced butter was fine,just the box for the needle was torn open, but the injector was still fine. So, Cheap and convenient, I opted for store brand. The marinade added a color to the meat and everything came out wonderful. Pleasing color as well as taste! Chris used a brine (as did I, my recipe follows), but I glazed my bird during the last 15 minutes of cook time. If you do use a glaze, be sure and limit the time in the heat to only about that much time. There is plenty of sugar in my glaze and I did not want the sugar to burn. I made up a batch of Jack Daniel's Tennessee Whiskey BBQ Sauce/Glaze for my bird. The glaze added a nice spicy bite to the meat and you just can not say enough about the beautiful glaze. This was being served at a back yard Whoop de Doo in honor of Larry, the Big Dude of BIG DUDE's ECLECTIC RAMBLINGS. Larry is at the tail end of a multi thousand mile RV trip with his wife, sister-in-law, grand daughter and 4 dogs. Sure, why not, if you are driving that far, everyone should have their own dog! Anyway, that's Larry in between my son visiting from the war (actually, he is in the Army (a Medic), stationed very close for a few months at Ft Riley, Kansas, but he does have his marching orders and next year he will be working on his tan as he closes down some of the outer bases on Afghanistan), and my neighbor and fellow RV owner, Jackie. That's a long way of saying I made this turkey with the Tennessee Whiskey glaze for my blogging buddy Larry with his Tennessee roots! So, my secrets... I used a BBQ Sauce glaze, I slow smoked for tenderness and flavor, I injected seasoned butter into the meat and finally I brined the bird for 24 hours before injecting and cooking. Mix everything in a large pot. Simmer over medium heat, stirring until salt and sugar has dissolved. Bring to a low boil and remove from heat and cover. Allow to cool (and for all the flavors to completely mix). Pour everything into a bucket just a bit bigger than the turkey. Place turkey into the brine, add additional water if needed to cover. After 24 hours, remove bird from brine and soak in clean water for 30 minutes to remove the heavy salt. Pat Bird dry, allow to air dry for another 10 minutes. Prepare as you like (Dry Rub, Injection, roast n oven, smoke, grill or some new way! This last weekend we were thrilled to have Larry, the Big Dude of Big Dude's Eclectic Rambling Blog stop in our little corner of the universe for a few days. Larry, Bev his wife, Pat his Sister -in-Law, Madison his Grand Daughter and 4 dogs (yes, everyone gets their own dog) have been RVing across the country for a couple of months. His blog is worth a look just for all the scenery he has posted along the way. After about 4,000 miles he pulled into the Cul-de-Sac on his way home. Jackie and I played host and tour guide, with an old fashioned Western Rodeo (how that cowboy jumped up after that 1500 pound bull landed on him we will never know), Jackie took the girls shopping and Larry and I got caught up on Kansas City's favorite native son, Harry Truman. But in between all the touring and shows, we threw a back yard BBQ Whoop de Doo for a little over a dozen of our closest friends. We enjoyed some of the best Turkey of my cooking life (come back tomorrow), a nice hunk of Beef for a thirty garlic roast (later this week), A beautiful sugar cured Salmon with a Cranberry sauce (even later this week) and some pork Baby Back Ribs glazed with this Jack Daniel's Whiskey BBQ sauce. Plus sides and desserts, I am pretty sure no one left hungry. But at the least it was a joy to watch my good blogging buddy fit right in with my neighbors, friends and family... It was indeed a Whoop de Doo! Feeding Larry... I highly recommend you giving it a shot whenever the rolling studio apartment comes close to your town! I am pretty sure I have a half a month's worth of posts from feeding Larry. Just keep coming back daily. I am starting with a new BBQ sauce I made, inspired by our visiting friends from Tennessee. It is a pretty spicy delicious and beautifully dark colored sauce/glaze using some good old Tennessee whisky. And when you think Tennessee Whisky, you MUST think Jack Daniels. Most of the recipe comes inspired by a copy cat recipe from TGIFriday that has been around for years. I made a few adjustments to turn their glaze into my sauce. As with most recipes that use booze as an ingredient, the actual alcohol cooks out so there is no one will guzzle the sauce and stumble away drunk. But what is left is the deep rich Earthy flavor of the whiskey melding with the spices and mixings used to make the sauce... Delicious in every possible way. There is quite a bot of sugar in the sauce, so be careful using this as a glaze. only glaze during the last 10-15 minutes of cooking time so that the sauce (and your BBQ meat) does not burn. Simmer over Medium heat, very low boil, until the sauce starts to thicken... About 10 minutes, stirring frequently. Serve with your favorite BBQ or glaze grilling meat about 5 minutes before you take the meat from the grill... And ENJOY! 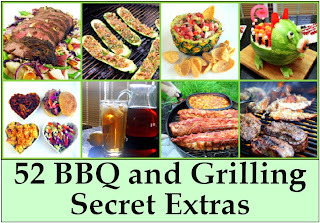 If you liked this post, you will LOVE all the little extras I have all in one page... 52 (more actually)... 52 BBQ and Grilling Secret Extras. You Too can become MASTER OF YOUR DOMAIN (as long as your domain is your own backyard)! Be "That Guy" (or Gal) who does back yard open fire cooking just a bit better than the neighbors. It is the little things that will set you apart.